We've seen some great concerts this year, but The KC All Stars at The Crossroads Thursday night was one of the best by far. Local Kansas City dance band "The KC All Stars", winners of KMBC-TV's "Best Band in Kansas City" showed exactly why they deserved that title. 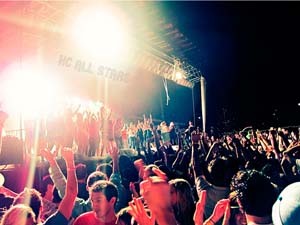 One of the final huge outdoor concerts of the season, this one delivered big time. 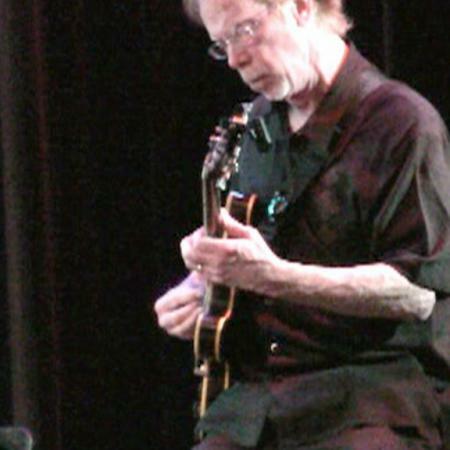 In an incredibly upbeat and energetic split set format, which is a KC All Stars staple, the band brought the audience to their feet and they stayed up and dancing for the entire show. When the concert started and the band hit the stage, the horns set the tone by blasting out the Stevie Wonder classic "Sir Duke (You Can Feel It All Over)" complete with dance steps and a blistering guitar solo by Kansas City's funkiest guitarist John Bridgewater, who teased the gawking crowd by playing the final scales behind his back - another KC All Stars staple. Then out came their incredible female vocalist, who won the National competition "Harrah's Lucky Break", going all the way to Los Angeles and taking home the trophy, returned to Kansas City to join the hottest band on the scene and perform stellar Kansas City concerts. This girl ripped out "Rude Boy" by Rihanna like she wrote the song herself and turned the concert on it's ear (no pun intended). The horns jumped off the stage and came out into the audience, playing in step (both are KU Marching Band Alumni) and circling the crowd all the way around the amphitheater before returning to the stage to kick off "Dynamite" by Tiao Cruz and then a modernized medley of Michael Jackson hits. Rocking the crowd to the point of exhaustion, the band certainly made everyone in attendance lose at least 5 pounds. As in most of their Kansas City concerts, for the grand finale they grabbed a stage full of people out of the audience and brought them up to join in the fun. Under clear and perfect skies, the weather cooperated and it was a wonderful "farewell" to the summer, and a perfect start to the fall. We're pretty sure that most everyone who attended is still recuperating today, but it's back to work for The KC All Stars who will start the machine up again tomorrow night on the ROOF of the downtown Kansas City Library (private event). Kansas City Concerts, The KC All Stars at The Crossroads, review by KCMB Kansas City News, official kc news site with breaking stories on The Kansas City Royals, Chiefs, charity events, the 2012 MLB All Star Game, weather, sports, MU, KU, ufo sightings, dui checkpoints, Kansas City neighborhoods, nightlife, concerts, the Sprint Center, the Power and Light District and current Kansas City news articles. The Chiefs had a disastrous start to their 2012 season, losing its first two games in convincing fashion. 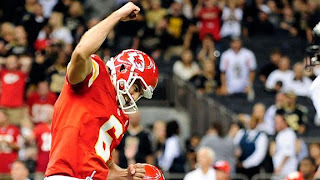 Last week, Kansas City was able to save its season and turn things around in a thrilling overtime victory over the New Orleans Saints. 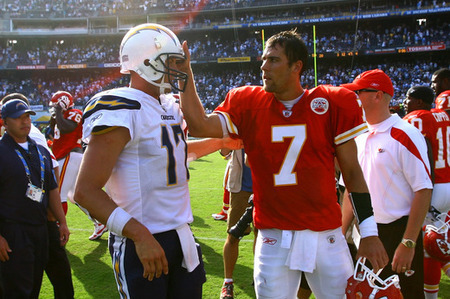 If the Chiefs want to keep their momentum going and pull to .500 on the season, they will need to take down a familiar foe: the San Diego Chargers. The first two weeks were a complete opposite for the Chargers, who cruised out to a 2-0 record. 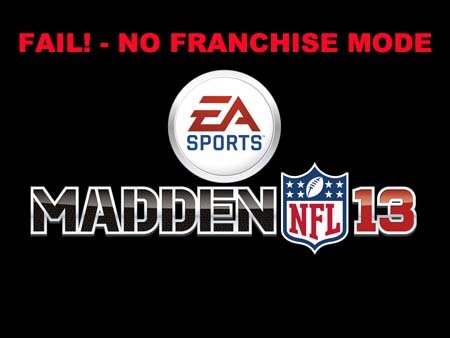 However, last week the team got absolutely shut down by the Atlanta Falcons, losing at home 27-3. Atlanta looks like one of the best teams in the league this year, but it was a disheartening effort for Chargers fans who thought the team’s early season struggles were a thing of the past. The biggest cause for concern with the Chargers is turnovers – Phillip Rivers threw two interceptions against Atlanta and has three this season. Rivers threw a whopping 20 picks last year, and has three so far this season. After taking good care of the football throughout his career, Rivers has been shaky lately, and the Chiefs’ secondary should have some chances to make a play. San Diego also has running back Ryan Mathews back from injury, although he lost a fumble last week and has a bad reputation of coughing up the football. The Chiefs should have a good chance to force some turnovers on Sunday, which could be the biggest factor in the game. The Chiefs have been battling injuries all season, and this game will be no different. Dexter McCluster, Peyton Hillis and Kevin Boss all got hurt against the Saints, and Hillis and Boss both have missed practice this week (while McCluster has been very limited). The team also lost starting center Rodney Hudson, who broke a bone in his leg and was placed on injured reserve. Ryan Lilja will move from guard to center to replace Hudson, while rookie Jeff Allen will start at guard. Kansas City already had some key injuries on defense, and now will have to rely on several rookies and inexperienced players to contribute. The last two meetings between these two teams were decided by a field goal, and this game has all the makings of another nail bitter. The Chiefs must take advantage of San Diego’s tendency to turn the ball over to pull this one out, and simply cannot afford to lose any more starters to injury. ﻿In the wake of the worst call you will ever see in sports and a team being unquestionably robbed of a win, the NFL and the NFL officials’ union started two days of intense negotiations. It appears that these negotiations have been a success, as an eight-year agreement has been reached between the two parties. 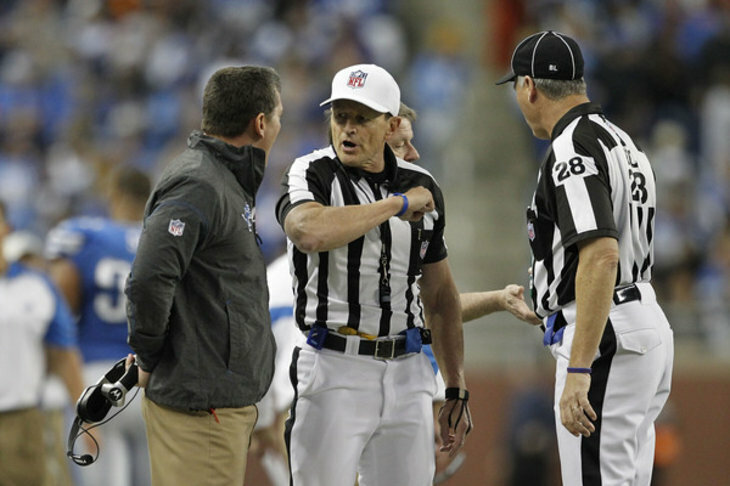 The NFL referee lockout is now officially over, and the regular officials will return for this weekend’s games. Several coaches, players and media analysts had strongly voiced their displeasure regarding the replacement officials throughout the season, although Monday night’s game between the Packers and Seahawks is likely what finally made the league cave in. The referees made a blatant wrong call at the end of the game while also missing the most obvious offensive pass interference call you will ever see. Even worse, the officials reviewed the play and still got it wrong. The public outcry after the game was absolutely shocking – current and former players, fans and the media all teed off on the league and the massive failure its replacement officials plan had become. This tentative deal must be ratified by at least 51 percent of the union’s 121 members, who plan on meeting and voting tomorrow and Saturday in Dallas, TX. Officials were adamant about working out a pension and retirement plan, despite the fact that they are part-time employees of the league. The new tentative plan calls for a salary increase from a league average of $149,000 a year to $173,000 in 2013, with an additional increase to $205,000 by 2019. Football fans can finally breathe a sigh of relief; however, it is unfortunate it took four games for the NFL to cave. While the regular officials are back, a team like Green Bay still has a loss on its record that shouldn’t be there. The league better hope the Packers go on a run and comfortably make the playoffs – if they finish one game out there will be another PR nightmare. Until then, we can all enjoy football with its proper officials, and hopefully erase the memories of watching failed Lingerie League refs try to officiate NFL games. The Chiefs were able to pick up a huge win in New Orleans on Sunday, saving their season and cooling the frustrations of a heated fan base. However, the win came with a big price, as Kansas City lost several players due to injury during the New Orleans game. Dexter McCluster, Peyton Hillis and Rodney Hudson all left Sunday’s game with an injury, and head coach Romeo Crennel indicated that at this point, he is unsure if any of the three will be able to play this Sunday. McCluster left the game in the second half with an elbow injury, Hillis has an injured ankle, and Hudson has injured his knee. McCluster has been a pleasant surprise for the Chiefs this season, posting 13 receptions and often finding ways to move the chains with his quickness and speed. What hurts the Chiefs is they have no one who can replace McCluster’s role – Dwayne Bowe and Jonathan Baldwin are bigger, downfield threats and Steve Breaston is more of a possession receiver. Rookie Devon Wylie was supposed to be used in a similar role as McCluster; however he has been hurt most of this season and is not ready for playing time. 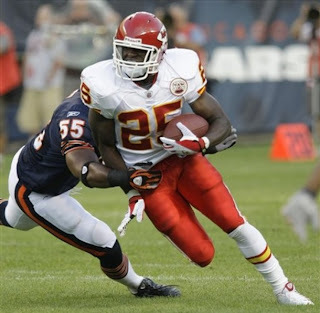 Hillis’ injury likely means more playing time for Shaun Draughn, as the team needs to limit the carries of Jamaal Charles. Charles had 39 touches against the Saints, far too many for an explosive back recovering from a serious knee injury. Hillis was signed to be a bruising, between the tackles runner who could give the Chiefs a change of pace from the dynamic Charles and take some of the work load off of him. Draughn had a solid preseason and has looked pretty good so far in a backup role this year. Hudson, the team’s starting center, was replaced by Ryan Lilja. Lilja normally starts at guard, and was replaced by rookie Jeff Allen after assuming the center duties. To address depth concerns, the team signed offensive lineman Russ Hochstein this week. This trio of hurt Chiefs join three others on the sideline – safety Kendrick Lewis, nose tackle Anthony Toribio and tight end Kevin Boss. It is still unclear if any of these players will be able to return for Sunday’s game against the San Diego Chargers. 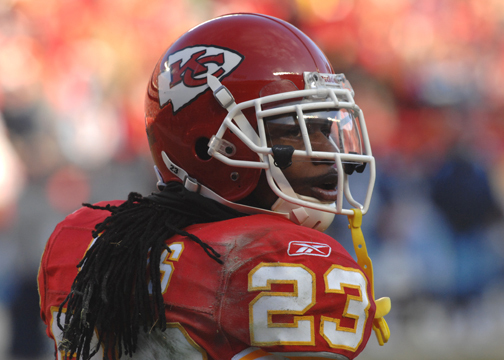 Injuries are a part of the NFL, but the Chiefs’ already had some serious depth concerns before losing McCluster, Hillis and Draughn. Some young players are going to have to step up and fill the void if the Chiefs are to pull off another upset and beat the Chargers this weekend. 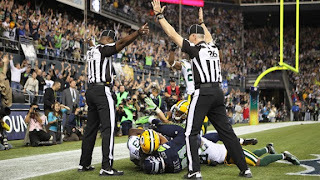 ﻿Just when it appeared that the NFL replacement referee fiasco couldn’t get any worst, last night happened. The Packers lost to the Seattle Seahawks on what will go down in history as the worst, most egregious, asinine and baffling game-deciding play in the history of football. The Seattle Seahawks were given a victory over the Green Bay Packers when a Packer interception was somehow ruled a touchdown. On the final play of the game, Seattle had to throw a jump ball in the end zone. Seahawks receiver Golden Tate first shoved the Packers Sam Shields so hard that the cornerback hit the ground. The refs ignored what was the most obvious pass interference call in the league’s history and let the jump ball continue. The Packers M.D. Jennings secured the ball with two hands, then hit the ground and rolled over. Replays showed that he had secure possession against his chest. Yet the refs gave Tate the touchdown, then reviewed the play, and ruled the call stood. This is the lowest moment in the NFL’s history. The league decided to replace its normal officials with low-level college officials, Arena League failures and even refs from the Lingerie League. The end result? 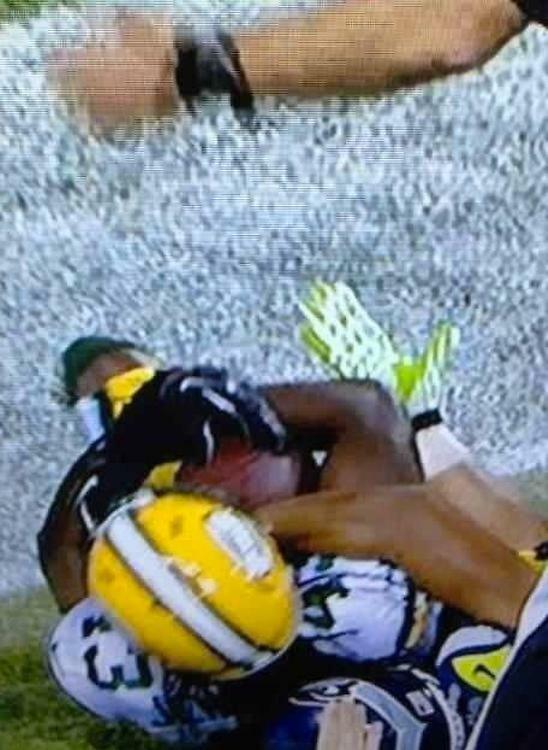 An NFL team was blatantly robbed of a victory. Welcome to the 2012 NFL season, ladies and gentlemen. 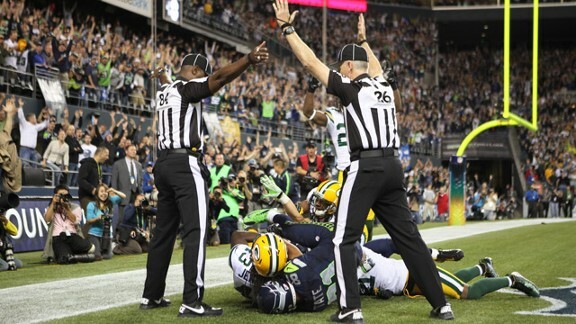 The officials made the worst call in sports history, but blame the NFL for having them out there in the first place. The league got tangled into a nasty labor dispute with its officials, and thought a rag-tag group could officiate NFL football. NFL fans should not put up with this any longer. Why watch a game for three and a half hours when this happens at the end? The greatest sports league in America, and possibly the world, has turned into a complete and utter joke. Yeah, don't try THAT at home. Danny Embrey kansas city best guitarist by KCMB Kansas City News, official kc news site with breaking stories on The Kansas City Royals, Chiefs, charity events, the 2012 MLB All Star Game, weather, sports, MU, KU, ufo sightings, dui checkpoints, Kansas City neighborhoods, nightlife, concerts, the Sprint Center, the Power and Light District and current Kansas City news articles. ﻿Bob Fescoe, radio personality and host of Fescoe in the Morning is making headlines today after throwing a fit on-air regarding the Kansas City Chiefs. Fescoe’s frustrations have seemingly hit a high point after Kansas City got off to an 0-2 start this season while being outscored 75-41. Fescoe’s frustrations are understandable, as the Chiefs have jumped out to an 0-2 start once again and haven’t even been competitive so far this season. However, the radio personality borders on ridiculous in his rant. Fescoe claims that Chiefs fans are embarrassing their mother, their father, the city, their wives and their children. What? I’m all for sports rants, as they have given us some of the funniest sound clips you will find and provide YouTube gold. But Fescoe’s rant isn’t funny, and he just seems like a bitter fan. He claims people are tired of spending money on tickets, parking, and refreshments at the stadium. Well Bob, if you are sick of it, stop going. Chiefs fans pride themselves on being one of the “best” groups in the country and making Arrowhead stadium an intimidating place to play. If you want to carry that label, you can’t simply abandon your team when they play poorly after two games. Fescoe also claims that the Chiefs give people nothing to live for. Really? I mean, seriously? Maybe there is a much more reasonable argument to be made – Kansas City isn’t that good of a football team, and they have played one of the best teams in the league followed by a borderline playoff team on the road. Throw in that they were missing three key defenders in week one and play one of the toughest schedules in the NFL and an 0-2 start doesn’t seem that far-fetched. Fescoe tries very hard to make his rant humorous. He claims he could have gone pumpkin shopping or drank cider in Louisburg rather than watch the Chiefs play – which again, isn’t funny. None of this is. This guy hosts a radio show? It is quite clear what all of this is: an attempt to grab headlines and coverage. Fescoe is simply trying to get attention because the media will always eat up a juicy sports rant. Naturally, there are several articles in newspapers and online this morning about the rant with sound clips. Congrats Bob, you did it! 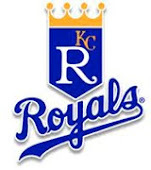 There is a reason I stopped listening to Kansas City sports radio years ago: it isn’t good. What initially put me off is that the hosts covering college sports all have clear agendas for their local team of choice. 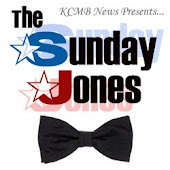 Jack Harry, of all people, gets to host a radio and television show – the same Jack Harry who picked the national runner-up and Big 12 champion Kansas Jayhawks to finish sixth in the league in basketball simply because he is a die-hard Mizzou fan. The same Jayhawks that have won the league eight years in a row. This guy has no clue what he is talking about 90% of the time and is a complete homer for one team, yet he is all over the airways. I’d rather watch paint dry than listen to this guy screaming on the air about nonsense. People like Harry would rather stir the pot than actually analyze and objectively look at teams and matchups. It gets people talking and boosts ratings - but it isn't good radio. Not to me, at least. Since I no longer listen to the local coverage, I had never heard of Bob Fescoe or his show. Judging by this rant, it looks like I’m not missing anything. Kansas City deserves better sports radio than this. Who Is To Blame For The Chiefs' Terrible Start? After yet another 0-2 start to the season, Chiefs fans are demanding to know who is to blame for the team’s disastrous start. Kansas City has given up 75 points over the first two games of the season, and looks nothing like a team many thought would challenge for the AFC West division title. When Kansas City got off to a rough start last season, most pointed the finger at former head coach Todd Haley, claiming he simply did not have his team ready to start the season. 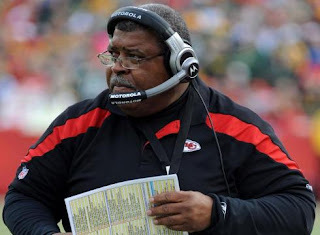 Romeo Crennel has received similar treatment from many Kansas City fans, especially because he is a defensive coach. Several media pundits have suggested that Crennel is stretched too thin juggling both the head coach and defensive coordinator positions. Crennel responded to the criticism yesterday, insisting that the blame rests more on his players failing to execute. Safety Abram Elam and linebacker Derrick Johnson have agreed with Crennel that they need to play better, but both also admitted to the media that communication could be better, and that at times, the players and coaches are not on the same page. If Crennel wants to turn things around quickly, he needs to stop pointing fingers at his players and accept ultimate responsibility for the defense’s performance. Crennel is a lot more expendable than guys like Johnson, Tamba Hali, Eric Berry and Brandon Flowers, especially since this is a second chance for him after his failure as a head coach in Cleveland. The biggest target for criticism after Kansas City’s start is embattled GM Scott Pioli, who has made headlines recently due to the Chiefs’ refusal to spend money and the stories about his actions told by Haley. 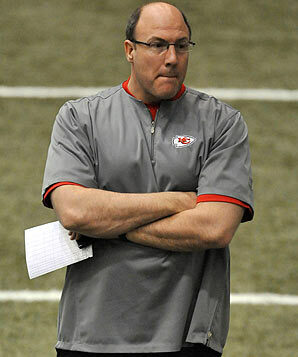 Pioli is the ultimate architect of the team, and so far, he has done little to make Kansas City a winner. 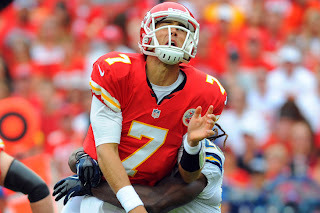 Many of the Chiefs’ top players were on the team when Pioli arrived, and his biggest acquisition so far has been the signing of quarterback Matt Cassel, who is an average-at-best starting NFL quarterback the Chiefs GM signed to a mammoth contract. Pioli hasn’t drafted very well either, and the result is that the team lacks significant depth. Kansas City’s horrible preseason record over the past couple of seasons is proof that the Chiefs simply are not very deep, and this ultimately falls on Pioli as well. Coaching and execution play a big role, but you need to have talent on your team to win. The blame may rest somewhere in the middle of the coaching, players and GM, but one thing is for certain – Kansas City needs to turn things around quickly. If the team drops its next couple of games, the franchise might have to blow everything up and enter yet another rebuilding project. The Kansas City Chiefs were no match for the Buffalo Bills yesterday, getting blown out on the road, 35-17. The loss means that the team has a 0-2 record for the sixth time in the last seven years. The final score makes the game seem closer than it actually was – Kansas City scored 14 points in the fourth quarter when the Bills had already put the game away and inserted their backups into the game (most notably former Chief Tyler Thigpen at quarterback). The team trailed 21-0 at halftime and 35-3 at the end of the third quarter. The Chiefs had several opportunities to get back into the game throughout, but costly mistakes and a failure to execute limited the team to three points. The most painful of these blown opportunities came late in the first half, when Peyton Hillis fumbled at the goal line and the ball was recovered by Buffalo. It was expected that the Chiefs’ defense would get a significant boost with the return of Tamba Hali and Brandon Flowers, but that wasn’t the case on Sunday. Buffalo’s C.J. Spiller ran all over the Chiefs’ defense for 123 yards and two touchdowns, and Ryan Fitzpatrick threw for two scores in an efficient outing. Even Kansas City’s special teams let them down, as Buffalo’s Leodis McKelvin returned a punt 88 yards for a touchdown late in the third quarter. The Chiefs’ offense was just as bad, putting together one of the ugliest first halves the team has seen in quite some time. The team gained only 71 yards on its first five possessions, looking overmatched by a Bills defense that had gotten dominated by a poor New York Jets offense last week. Things were so bad that Spiller nearly out-gained the entire Kansas City offense by himself in the first half. Matt Cassel ended up throwing for 301 yards and two touchdowns to Dwayne Bowe, but most of his production came late in the game when things were already decided. Cassel’s play in the first half was borderline terrible, and he has yet to show any consistency this season. The bottom line is that once again, the Chiefs were not ready to start a regular season. For two straight years, the team has had a terrible preseason followed by two blow-out losses in weeks one and two, proving that Kansas City simply is not ready to play. The Chiefs have a very difficult schedule, facing the Saints, Chargers and Ravens in their next three games. An 0-5 record is a distinct possibility after the first two weeks. 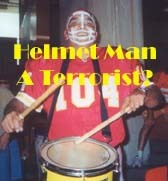 Known to most Kansas City Chiefs fans as "Helmet Man", or even Edgar Sanchez, former terrorist informant Wahed Moharam charged into the State Building in downtown Kansas City freaking out and yelling out the question "why am I on the terrorist list?" and somehow alluding that there was a bomb in his car, which was parked in a handicap space near the State Building. When the story first broke the news misquoted Helmet Man as saying the "he was a terrorist" but he did not say that, he simply demanded to know why he was listed as a terrorist on the FBI's watch list. In 1993 Wahed Moharam helped the United States capture 3 known terrorists connected with the World Trade Center bombing and was subsequently put into the witness protection program and given the name Edgar Sanchez. He moved to Kansas City and became an avid and outspoken Chiefs fan known to fans as "Helmet Man" donning an airbrushed helmet on his bald head and beating on a drum strapped around his neck. 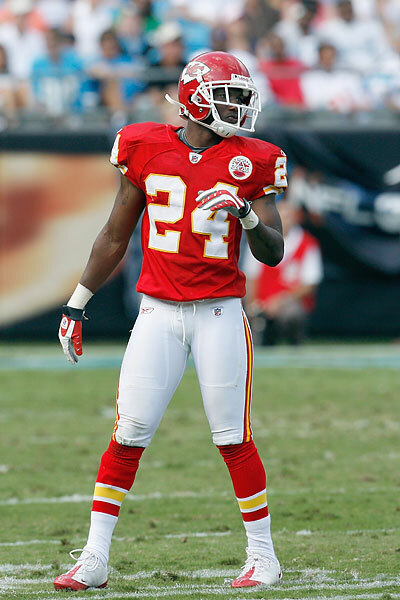 In 2003, his season tickets were revoked due to his being added to the FBI's Watch List as a precaution by Chiefs administration. It seems that Wahed Moharam was very upset at the fact that he had helped out the United States government and then was somehow added to the FBI's Watch List and started having bad things happen to him, like losing his Chiefs season tickets. Helmet Man's car is still being searched after bomb sniffing dogs sent up an alarm, which in turn brought out the bomb seeking robot who found a hand gun but nothing else so far. 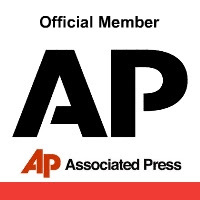 In another breaking story that happened right in the middle of this, a man drove into the Arrowhead Stadium parking lot, shot and injured a woman in a golf cart and then shot and killed himself. Kansas City definitely made CNN today! 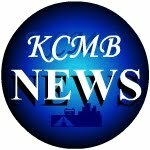 We will keep you posted here at KCMB Kansas City News. A social media fiasco ensued yesterday when a Kansas City Chiefs fan voiced his frustrations about the team via Twitter – only to have the official Chiefs twitter feed message him back. The Chiefs’ official twitter feed responded with a direct message to Wright, tweeting “Would help if you had your facts straight. Your choice to be a fan. Cc get a clue.” The Chiefs followed this up by blocking Wright from their feed. There are two sides to this story. One, Wright is correct that the Chiefs do have a lot of money to spend. In actuality, Kansas City has $16.5 million to spend, the fourth highest amount in the league behind the Titans, Jaguars and Browns. Also, while Wright’s rant was childish, the person who runs the Chiefs twitter feed should always take the high road and not get into it with a frustrated fan after a blowout loss to start the season – especially one that has over 120,000 followers (more than the Chiefs feed has). There has been no official word from the Chiefs’ organization so far, but if the story continues to get bigger, the team may very well address the situation. The Chiefs’ season opener is in the books, and the team will try to regroup after an embarrassing home loss to the Atlanta Falcons on Sunday. Kansas City still has some major question marks on both sides of the ball in regards to injuries and personnel decisions, and it will be interesting to see how this translates to the team’s second game against the Buffalo Bills. The biggest question regarding the defense is whether or not Brandon Flowers will be able to play this Sunday. After it appeared that Flowers would be able to go against the Falcons, he was held out of the game due to an ongoing foot injury. Head coach Romeo Crennel has stated that if Flowers can practice, he will play. This week’s practices will be a telling sign on whether or not Flowers is ready to start again for the Chiefs. Flowers’ return is even more crucial because his normal backup, Jalil Brown, is battling a groin injury and barely played against Atlanta. Jacques Reeves got torched by Julio Jones several times on Sunday, showing how crucial a healthy Flowers is to the defense. 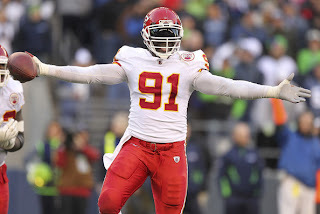 One player who was missing Sunday that will for sure suit up against the Bills is Tamba Hali, who has served his one-game suspension and is officially back. Kansas City’s pass rush against the Falcons was weak – while Justin Houston got a sack and pressured Matt Ryan several times, Edgar Jones (who played in Hali’s spot on passing downs) failed to get to Ryan. Hali’s return should make a big difference this Sunday against Buffalo. Offensively, most Chiefs fans are wondering where last year’s first-round pick Jonathan Baldwin has gone. Against Atlanta, Baldwin did not start (the Chiefs started Steve Breaston and Dexter McCluster) and did not receive a target. It didn’t seem like he even got on the field. For the game, McCluster received ten targets, while Dwayne Bowe and Tony Moeaki each received six. The coaches raved about Baldwin during training camp, and it appeared that he was on the verge of breaking out and having a big season. Not seeing him get much action has to be disheartening for Chiefs fans, and many will wonder if the team has yet again whiffed on a first round pick. The Kansas City Chiefs’ 2012 season got off to a rocky start yesterday, as the team fell to the Atlanta Falcons, 40-24. A disastrous second half ultimately did the Chiefs in, and the team is once again starting the season off with a loss. Atlanta was the favorite, and the Chiefs were hit hard with injuries to key players that impacted the game. It appeared that cornerback Brandon Flowers was going to play, however the team decided to hold him out of Sunday’s game. With injuries to safety Kendrick Lewis and defensive tackle Anthony Toribio, as well as Tamba Hali’s absence due to a one game suspension, the Chiefs entered the game missing several critical components to its defense. Despite being out-manned, Kansas City hung right with Atlanta throughout the first half. The team consistently moved the ball and found themselves only trailing 20-17 at the break. 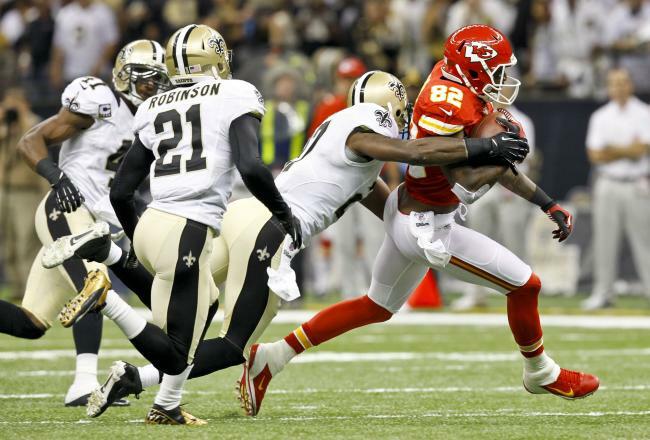 However, the third quarter proved to be disastrous for the Chiefs. Ryan Succop missed a field goal, and the Falcons answered with a touchdown minutes later to take a 27-17 lead. On the team’s next possession, Cassel fumbled while getting sacked, giving Atlanta another short field to work with. Former Chief great Tony Gonzalez hauled in a seven yard touchdown catch to give the Falcons a commanding 34-17 lead. After a couple more Atlanta field goals, Kansas City found itself down 40-17 in the fourth, and a Shaun Draughn touchdown in the game’s waning seconds made the game look closer than it really was. Offensively, the team managed to run the ball effectively, and Jamaal Charles looked like his old self in the first half. Unfortunately, the team was unable to overcome Matt Cassel’s up-and-down performance. Cassel made some good plays, but his three turnovers gave Atlanta a short field, which the Falcons exploited every time. Cassel has to make better decisions and limit his turnovers, especially while the defense struggles to get healthy. 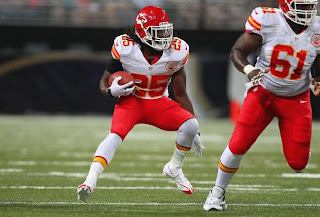 Expect the Chiefs to rely on the ground game even more in the future, especially now that Charles has proven that he is fully recovered from his ACL tear. It is hard to judge the Chiefs defense after this game because so many key players were missing. Kansas City was without its top pass rusher, top corner and a starting safety, and Matt Ryan took advantage and had a field day. Hali’s return will give this unit a significant boost, but the team has got to get Flowers back soon. He should be close to returning, and a healthier Chiefs defense should look a lot better in week two. Next up for Kansas City are the Buffalo Bills, who got blown out by the New York Jets in week one. The game is in Buffalo, with a 12:00 p.m. kickoff. 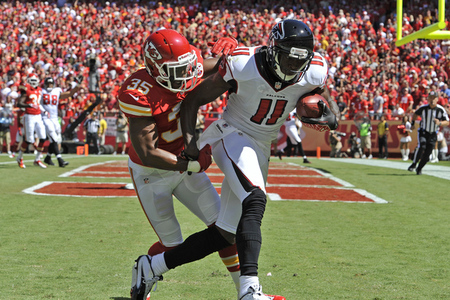 The Chiefs’ 2012 regular season kicks off this Sunday with a 12:00 p.m. home game against the Atlanta Falcons. Currently, Vegas favors the Falcons by three points. There is good news and bad news for Chiefs fans entering this game. The good news is that it appears that both Derrick Johnson and Brandon Flowers will be able to play on Sunday. Johnson had injured his ankle, and Flowers has been sidelined with a nagging foot injury before returning to practice on Wednesday and seeing snaps with the first-team defense. Stopping the Falcons without these two players would have been nearly impossible, and if they are close to full-strength, it is a huge boost for Kansas City’s defense. The bad news is that the Chiefs are still missing several key players for this game. Tamba Hali is serving a one-game suspension, and starting safety Kendrick Lewis is also out. The team has several other players banged up on defense, and as we saw this preseason, the Chiefs’ defensive depth is nearly non-existent. The team cannot allow Matt Ryan to have all day to throw, and Kansas City may have to get a bit creative with their blitz schemes to pressure Ryan and try to force some turnovers. The game will also serve as a homecoming for legendary tight end Tony Gonzalez, who is likely entering the final season in his hall-of-fame career. Gonzalez was traded to the Falcons in 2009 for a second round pick, which the team used on defensive back and kick returner Javier Arenas. Gonzalez holds the Chief team records in receptions, receiving yards and touchdown catches, and this will be the first time he has faced his former team. Atlanta enters this season with huge expectations, and the biggest question mark surrounding the team is whether or not it can take the next step and contend for a championship. The Falcons have lost to the eventual Superbowl champion in the last two playoffs, getting blown out by the Packers two seasons ago and falling 24-2 to the Giants last year. Matt Ryan is a good quarterback, and he is surrounded by talented playmakers. Ryan played very well in the second half of last season, and if he is on against a depleted Chiefs defense, Kansas City might not have much of a chance. Defensively, the Falcons added four-time pro bowl cornerback Asante Samuel this offseason, pairing him with Brent Grimes and Dunta Robinson to form a dangerous secondary. The Falcons’ biggest question mark on defense will be whether or not it can effective rush the passer and contain the Chiefs’ running game. Atlanta’s front seven may very well determine the outcome of the game. The Chiefs 2012 regular season opener is only four days away, and the team is still waiting to see if they will have several key players available for their matchup against the Atlanta Falcons. Cornerback Brandon Flowers, defensive tackle Anthony Toribio, linebacker Derrick Johnson, quarterback Brady Quinn and safety Kendrick Lewis are all uncertain for week one. 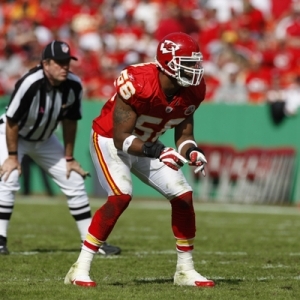 It appears that Derrick Johnson has a strong chance to play Sunday, according to head coach Romeo Crennel. The ankle injury Johnson suffered in the team’s final preseason game against the Green Bay Packers appeared to be serious, but the Chiefs’ Pro Bowl linebacker has made great progress this week. Toribio and Flowers are still major question marks. Toribio is out of a walking boot, but his status is uncertain. If he cannot go, the Chiefs will start this year’s first-round pick, Dontari Poe, at nose tackle. Flowers, the team’s best cornerback, has been battling a foot injury for several weeks. The least likely to play out of all the injured players is Lewis, who has just started to work out again after sporting a sling for a few weeks due to a shoulder injury suffered in the team’s preseason game against the St. Louis Rams. Crennel mentioned that he doubts Lewis will be ready for week one and his injury could hold him out longer. Atlanta is a good team, and the absence of any of these players will be a big blow to Kansas City. If Johnson plays, he may have limited mobility, and losing Flowers and Lewis would be a crushing blow to a secondary that is thin on depth. Add in that Pro Bowl pass rusher Tamba Hali is suspended for this game, and suddenly week one doesn’t look very promising for the Chiefs. The Chiefs have finalized their 53 man roster, and recently signed eight of the players they had cut to the practice squad. This means that the team’s roster and depth chart is fully set for the start of the regular season, which begins this Sunday. However, this list was not set in stone, and team has recently made some changes. Hemingway was cut, and Kansas City signed offensive lineman Rich Ranglin. The team is deep at wide receiver and could use some added depth to the offensive line, and Hemmingway found himself as the odd man out. Ranglin has spent the past three seasons in the Arena League, and won the league’s offensive lineman of the year award in 2011 with the Kansas City Command. There were a few surprises regarding who made the team’s 53 man roster. The team decided to keep four tight ends, which may hint that the Chiefs plan on using a two tight-end set quite a bit this season. The decision to release DiMarco was also interesting, as Kansas City now has no true fullbacks on the roster. DiMarco’s release was likely due to the emergence of Nate Eachus, who ended up making the team as a running back. Eachus saw snaps at fullback in training camp, and ran well as a halfback during the preseason for Kansas City. The Chiefs ended up keeping four other running backs apart from Eachus – Jamaal Charles, Shaun Draughn, Peyton Hillis and Cyrus Gray. The team also decided to keep third-string quarterback Ricky Stanzi, which has brought the Chiefs some criticism. Many teams only keep two quarterbacks on the active roster, and Stanzi’s inclusion takes up a roster spot that could be used where Kansas City lacks depth. Stanzi did not play well during the preseason, and many feel it is time for the team to cut ties with the former Iowa standout and begin developing another young quarterback. 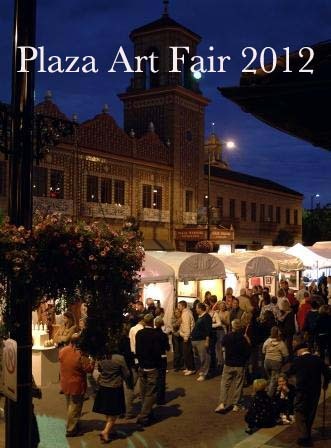 Defensively, the biggest surprise is likely defensive back Tysyn Hartman, who played his college ball at Kansas State. Hartman’s inclusion means that the team currently has ten defensive backs on its roster. Tamba Hali, who is suspended for week one, does not count against the team’s current 53 man roster, which means the Chiefs will have to release one player when Hali returns. Many feel Hartman may be dropped, and the team will keep nine defensive backs. Kansas City has placed quarterback Alex Tanney and defensive back De’Quan Menzie on injured reserve. Tanney has a hand injury, while Menzie has been battling a hip injury for several weeks.